Today I’m tackling my extra batting pile (this is maybe 1/4 of it). I’ve been lazy at using up my large pieces as I go…instead I throw them in my closet and hope they’ll magically piece themselves together. No surprise they didn’t….so I’m biting the bullet and getting it done. I’m piecing mine into crib size pieces and larger by butting the straight ends together and doing a large zig-zag stitch. It’s actually very fulfilling (but boring) to use up all those scraps….even if it does make for some slightly wonky battings. Very good idea! I have some I could piece myself. The question is, will I?? Thanks for your move-eee-tational post! I need to get moving on this task myself! It's on my "de-cluttering" list. I do the same thing. So nice to have on hand when you make a baby quilt or something. That keeps the cost down too : ) Love your blog! I save all my batting pieces, too. And, you know, I eventually use every little piece! Great idea! What type of batting do you use? And where do you get it? I have to admit so far I've just used old flannel sheets and mattress pads. Yep I am a firm believer of using what I have but now that I am making quilts for others I really need to ante up and buy some batting but there are so many options out there. Store wise we have a JoAnn Fabric, local quilt store, and Hobby Lobby. But I am not opposed to ordering on-line in order to find the best prices. Thanks a ton for any info you can pass along!! That is how I do it also, but once they are quilted it is hard to see where the seam is. Hi. I read your blog all the time , however dont usually comment. Their is a product made just for batting that is a tape that you heat press. It doesnt buckle the batting and you can be done in a snap. A good quilt shop will have it. I do that a lot. Especially for wall hangings and pillows. I always feel so good about getting yet another project out of the batting scraps rather than cut into a large quilt size piece. just did this a few days ago and had enough for 2 crib sized quilts! I have been using mine up as mug rugs, and quilt as you go blocks! I enjoy seeing a corner of the room that has been missing for awhile!!! LOL! I was doing this late last night for a couple of small projects. I use every drop of batting (smallest pieces are used to stuff pincushions, etc). i call it Frankenbatting. I use the zig zag stitch that takes a couple of small stitches across the width and between that and my walking foot, I don't get any puckers. I try to sew up the frankenbatting after every few projects, so the scraps don't get out of hand. It's great for pillows. I try to reuse anything more than a few inches wide, even if it is just made into FMQ practice sandwiches. I find the iron on tape too expensive for the amount of reconfiguring of batting that I do. Thread is cheaper. I hand dye mine and cut them up for shapes on pillows and quilts. I also give some away each year to local schools and find sewing them together works just as well as the tap does. I am blessed to have been given 3 rolls of batting a few years back and I still have 1 and 3/4 of those left! This is right up there with organizing scraps…boring, but someone has to do it, right? I actually find that kind of a calming exercise. Lots of machine humming, very little thinking… it's cleansing! Way to tackle the less-desirable! Girl after my own heart! I love doing this, it makes me feel connected to quilters of the past who couldnt run down the store to buy all the new fabric and gadgets and had to "make do"! Just another form of piecing! What a relief to read this! I have been a "closet piecer" for many years. I was sure that there was some "rule" that it would not a)lay flat, b)make you finished piece later fall apart, c)just be bad, bad, bad. To see batting go to waste was more than my frugal soul could handle, so a lot of my smaller projects get pieced. Thank you, thank you… now I don't feel so guilty, but rather virtuous! I do this too! Although I use a long skinny piece of thin iron on interfacing. And then I write the size of the piece and what kind of batting it is on a piece of paper and pin it to the batting! Then I don't have to pull it all out and try to find one the right size. I do the same thing; its a great way to use up leftovers for cot quilts. I sew mine and they are "wonky". Glad I'm not the only one. Can you tell me the #foot you are using please, is it a walking foot? Thanks so much. I bet you are starting to feel pregnant. Hope you are well. I do this all of the time, especially for scrappy quilts. I love the idea of using up my scraps for the top and bottom and then using up scraps of batting for the middle. I do not like to waste anything. Thanks for the inspiration! I was just looking at my pile of batting scraps and thinking I need to do something about it. Brilliant – I am not the only one who thinks of this – just was not sure how to attach well together. 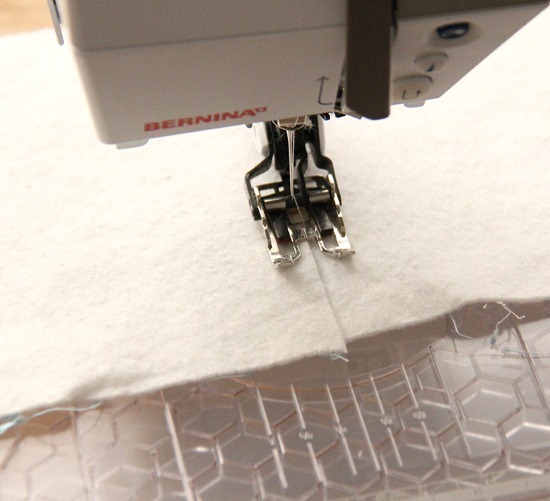 Quilting friends gasp when I suggested this one – saying it was being stingy!!! Thanks! I will do this next time I need wadding! I so need to do that, I am working on lots of baby quilts right now. This is going to the top of my to do list. Love the idea of lableing them as to the size so I wouldn't have to dig around so much. Love your blog! I'm pretty sure if I wait long enough, they'll piece themselves…..won't they? Ugh. Yeah, I've never seen it happen, but I yet I still have hope. My pile is growing, as well. I cut into a brand new sheet of insulbright last week, instead of piecing a couple of scraps of batting, talk about lazy! Luckily, I managed to squeak out a couple of straps without piecing! I do a lot of quilting for charity and we take 2" strips of very lightweight interfacing and iron pieces of batting together after they have been straightened out and cut to similar sizes. No lumps or bumps as when they are zig-zagged together. 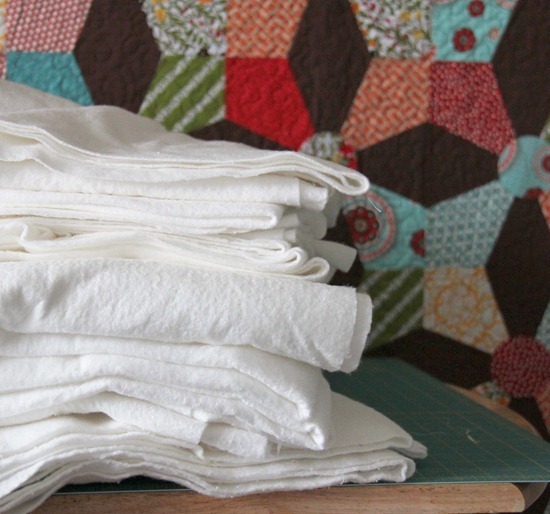 Do you use regular batting or flannel inside your baby quilts? No hurry. I know you are busy. And thank you. Ooooh my! Really good of you to do this in advance! I usually go on a scavenger hunt through the house, finding the bits and pieces of batting that I (think I) need! This looks much, much better! Glad to see that i'm not the only one who does that! I need to do that too! I have a HUGE pile of pieces that need to be pieced together…. I do the same thing myself. My hubby is always asking why I bother to keep those odd scraps and I keep telling him they are useful. See you just proved I'm not crazy! Well, not on in this area anyway! It is boring sewing, but just think of the money you are saving! Good on ya for facing the monotony! As a newbee, I've been making mug rugs for quilt practice, and even pieced together batting scraps for those, using a zigzag. Glad to know I did it correctly! Oh, I am so glad I am not the only one who does this! I though maybe it was a quilting no-no, but it seems so wasteful if it's bad! Glad I'm not the only one out there. I did that last week and after putting together all my scraps I had pieces for a couple runners and wall hangings. Have fun! i did one with black thread. yeah. it's the worst thing ever to do! you can faintly see it through the quilt. what a nimrod. Genius idea. I guess i need to get out more often because i certainly have never heard of that. Love it!